“That Weekend in Albania” by Peter J. Meehan was a bit different than I thought it would be. I was expecting a travel journey, however, it was a novel about an ex-patriot’s family, family relationships and the turmoil in Albania after 9/11, conflict about Kosovo and corruption and infrastructure issues. I found it somewhat confusing as to what theme the author wanted to present, but he does present some interesting information about the social culture of Albania. The author did a good job in describing the cultural shock, language barriers and high-risk situations. I was not sure of Tony’s relationship with Bega as it seems Bega was corrupt and would use any means to find out exactly what Tony’s purpose was. It appears to me that his purpose was to find out about corruption and stalling of American interests in Albania. I found it interesting that Muslims were in great number in this area as I don’t remember this from information I gleaned while doing research. Tony’s daughter Machaela seemed to be rather spoiled and had a questionable relationship with on again off again Malik. It was almost as if he saw her as a child rather than the woman she was. Malik was Muslim, and anytime she questioned him about his faith he was evasive. 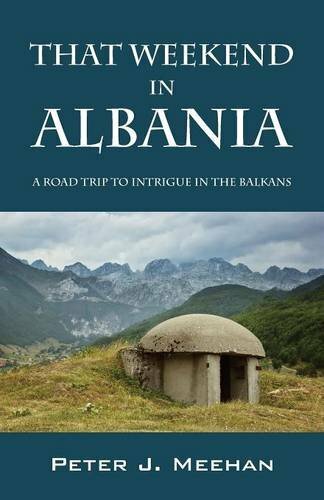 I found the first part of the book to be interesting as it provided a lot of information on the state of Albania, Kosovo and surrounding areas. It doesn’t surprise me on the corruption, money laundering and attempts to get rid of unsavory individuals. Most readers will not know this information in general, and I do like how the author presented Tony’s leadership. The latter part of the book left me trying to figure out what Malik’s role was in the plot. Overall I think Peter J. Meehan did a good job on his research and capturing the climate of the Balkan’s. “That Weekend in Albania” would be an enjoyable read for those with a general idea of the area and political environment.